Dario Resta’s Mercedes was leading for the final two laps but he failed to change to the finishing straight for the chequered flag, carried on for an extra lap… and still finished third. Brooklands was a sort of ‘banked-oval’ and had a flat straight (and the pits) within the oval whence cars both started and finished. Dario Resta put in a protest but officials didn’t want to know. Nevertheless the following month, in the same Mercedes, he claimed his first win, in the Brooklands held, Prix de la France. In 1908, at the Easter meeting, Dario Resta was leading Frank Newton’s Napier but, as Newton began to pass he slipped down the banking and the two cars interlocked and were both damaged – Napier went slowly on to win, while Dario Resta limped into second. After the race Resta put in a protest but, as in 1907, it failed. In July, Dario Resta took part in the third ACF Grand Prix. This race, a kind of World Championship of its era, took place in Dieppe. Dario Resta, at the wheel of an Austin, finished 19th, four minutes behind Moore Brabazon’s Austin and two hours behind the winner, Christian Lautenschlager in a Mercedes. Back in England Dario Resta won the 2nd Montague Cup, in his usual Mercedes, but later races garnered little success, including the first Tourist Trophy on the Isle of Man… but there were two French Hillmans in this race, driven by Louis Coatalen and Kenelm Lee Guinness, the KLG spark plugs founder, and Coatalen (also an inspired engineer) was subsequently recruited by Sunbeam (presumably without the bother of ‘gardening-leave’…) and, after becoming chief designer, was apparently instrumental in having Dario Resta join Sunbeam, in 1912, when some success returned – in the two-day ACF Grand Prix in Dieppe. At the end of the first day Resta was running third, and eventually finished fourth. Meanwhile Sunbeam had been closely examining the ultra successful, and revolutionary 1913 Peugeot L76 – the first car in the world with a hemi-head engine, double overhead camshafts and four valves per cylinder. This 7.6- litre engine, inspired both Miller and Offenhauser in the USA, as well as Sunbeam who prepared a new car for the 1914 season. With little racing in Europe in 1914 Dario Resta went to America on behalf of Sunbeam… and met the local Peugeot importer… who offered him a Peugeot EX3, for 1915. Perhaps being Italian at heart, Dario Resta knew this was an offer he could not refuse – and so the legend was born. In February, 1915, Dario Resta won the 400 mile wet American Grand Prize on a seafront track in the San Francisco (Santa Monica ?) area after leading for all but ten laps… and, a week later, on the same track, won the inaugural, 300 mile, Vanderbilt Cup, and led for all but the first twenty laps. From there the teams moved on to Indianapolis, for the also prestigious ‘500’… where the drivers had to qualify for grid positions – instead of picking numbers out of a hat… Dario Resta lined up in third place at 98.47 mph. The race was likened to the final ACF Grand Prix – Mercedes v Peugeot – Germany v France – but two Italians dominated the race, with Dario Resta finishing second (for Peugeot) to Ralph de Palma (for Mercedes…). Dario Resta had suffered a puncture, causing an extra pit-stop… while the Mercedes lost a con-rod, but still managed to stagger across the line. However, Dario Resta was back in the winner’s circle at the next race, the inaugural event at the Chicago Speedway, on wood boards, establishing a new 500-mile record of 97.58 mph. Later Dario Resta returned to Chicago to win the 100-mile Challenge Cup, and created another record, finishing at 101.86 mph – the first 100- mile race to be completed in under one hour… causing a local newspaper to run the headline: Who better than Resta? 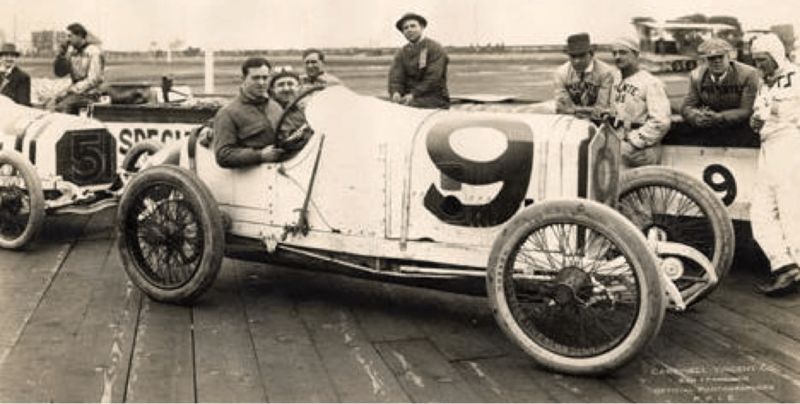 1915 was a real success for Dario Resta, winning five out of nine races and leading 39% of the total distance of these nine races, earning him $39,900 of prize money. There was no official championship in 1915 but Motor Age magazine ran an unofficial ‘road-racing’ championship and named Earl Cooper champion with Dario Resta second. This was due to his two victories in San Francisco at the beginning of the year which were the only two road races in which Resta took part – the seven other races were on board tracks, a dirt oval (Sioux City), cement (Minneapolis) and a brick oval (Indy). The “champion” took part in five road races and won twice. After his first two wins Dario Resta upset the American drivers by trying to explain why they were failing to win. The Lima Daily News reported: “The American driver is too averse to gear shifting to do really effective work. After he once has his car in high, he lets it stay there, instead of helping it out once in a while by slipping into third or second.” When Resta retired from the subsequent Sioux 300 The Indianapolis Sunday Star suggested: Resta was afraid of the dirt track. A very short clip of Dario Resta winning the 1915 Vanderbilt Cup. Dario Resta’s young wife was proud of her husband’s achievements but hated his occupation… Her brother had been killed a year earlier, although this had not stopped Mary eloping with Dario only months afterwards. In a March, 1915 edition of The Wisconsin [?] State Journal: “I aged ten years during the four hours my husband was speeding to victory – a fearful vigil! His laurels have left a scar upon my heart.” Instead of watching, Mary had cowered in terror. 1916 established the first official AAA Championship, the first race being won by Eddie Rickenbacker, a 26-year old driver who was soon to become an aviation ace during World War I, was a car manufacturer from 1925 to 1927, the proprietor of Indianapolis Speedway from 1927 to 1946 and chairman of Eastern Airlines from 1938 to 1963…! 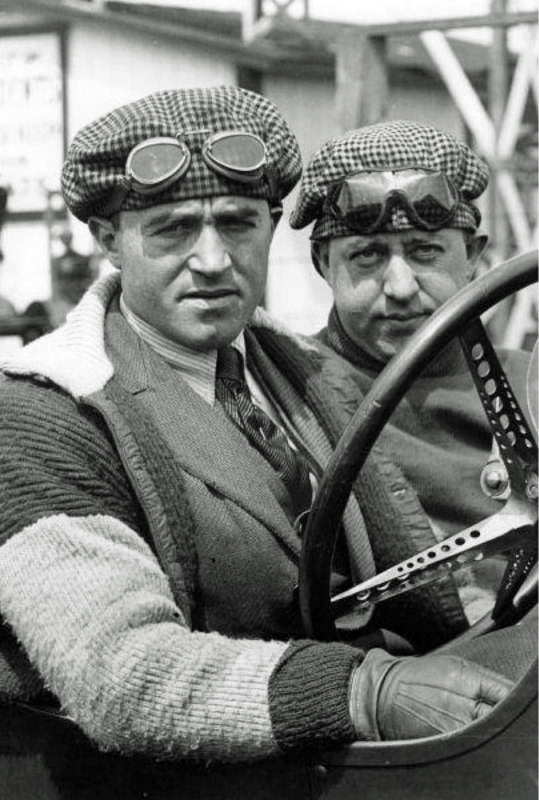 Two weeks later, the drivers were at Indianapolis for the… er… 300-mile race, the only time this famous event wasn’t run over 500 miles (except when the race has been stopped due to rain). Dario Resta put his Peugeot fourth on the grid at 94.4 mph. Aitken (Peugeot) was on pole at 96.69 mph, followed by Rickenbacker (Maxwell) and Anderson (Premier). Resta took the lead on lap 18 and kept it until the 120th and final lap, winning at an average speed of 84 mph, and now leading the AAA championship… which he extended with another victory in Chicago (after a tight battle with de Palma). But he missed the next two races and both were won by de Palma who was now right behind Dario Resta in the championship. None of the main drivers seemed to have competed in every race (?) and a string of successes put John Aitken in a very slim lead at the mid-point of the season although Dario Resta then won the Chicago 300, the Minneapolis 150 and the Omaha 150 races.. By November the Vanderbilt Cup had Dario Resta leading from flag-to-flag and, with Rickenbacker, Aitken and Cooper all retiring, Resta was still in a strong position for the first American Championship. Two days later (whenever did the mechanics sleep…!?) 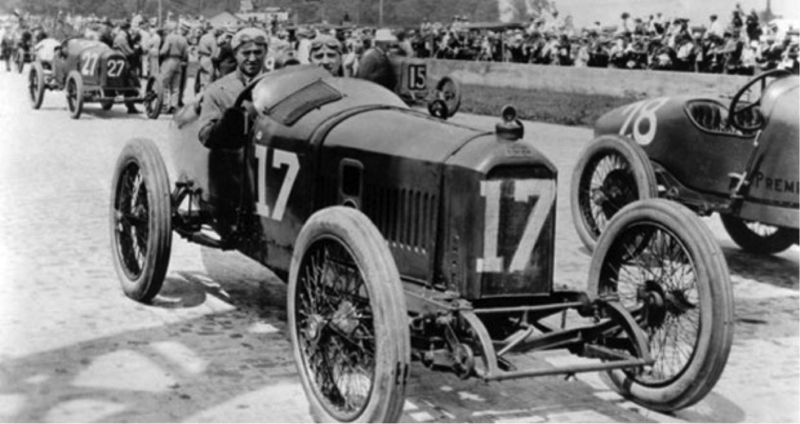 came the American Grand Prize, on the same track, where Dario Resta established an immediate lead but soon retired with ignition problems… but Aitken and Rickenbacker also retired… but then both came back to finish first and fifth respectively… Both drivers had taken over cars from team-mates, but were not allotted championship points, leaving Dario Resta in an unassailable position and, without appearing in the final Ascot Derby, in Los Angeles, which was won by Rickenbacker, Dario Resta was hailed as the first ever AAA Champion… having won six races (more than anyone else) and led 40% of the laps, and earned $44,650… In all Dario Resta won eleven of the eighteen races over the two year, 1915-16, period. Sunbeam in GP races… finishing third in the Penya Rhin GP, in the Talbot. 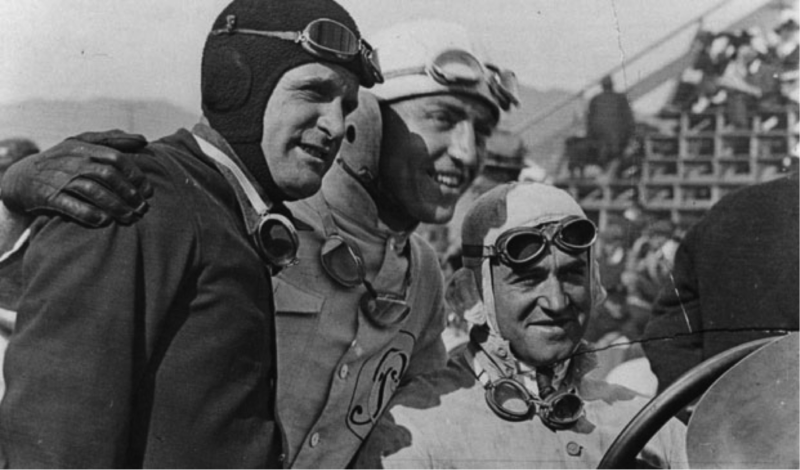 On that same day, driving in a Chiribiri, was the soon to be great, Tazio Nuvolari… who finished fifth. Later in the year Dario Resta won the Spanish GP (for voiturettes). Tazio Nuvolari was placed fourth. A month later, on 2nd September, 1924, Dario Resta was back at Brooklands, scene of his first successes, seventeen years before, attempting new speed records in a Sunbeam. A security belt broke and punctured a tyre which blew instantly. Dario Resta lost control, crashed through a fence, and his car caught on fire. Bill Perkins, the riding mechanic, was only injured but Dario did not survive. He was a great champion and deserves much more than a brief mention in some Indy statistics… and half a page in Wikipedia. Meanwhile Bill Perkins, was forced to miss the San Sebastian Grand Prix a few weeks later. Perkins was Sunbeam’s K.L.Guinness’s regular riding-mechanic and so was substituted by Tom Barrett. KLG suffered a serious crash during this race, and the unfortunate Barrett was killed. This crash led to the end of the practice of carrying riding-mechanics during races. On the 8th April, 2011 it was revealed that Paul’s Aunt Delizia ran an adult entertainment club in Edinburgh, called ‘Bottom’s Up’. And her brother, Paul’s Uncle Tom, seemed to run a similar club in the Scottish capital, called ‘Fantasy Palace’. And Tom and Delizia acquired their skills in such businesses from their 81-year old father – Paul’s grandfather – who was the proud owner of the ‘Ambassador’ sauna/brothel. And Paul’s father Louis was also a club owner, heading multiple such locations, among which the best known is ‘The Twig’ in Bathgate. Unsurprisingly there aren’t a lot of film clips out there for Dario Resta but this three minutes of the first Indy 500, in 1911, gives a flavour of the times. I don’t know how you become a black sheep in a family of pimps. And where did that ‘di’ come from?